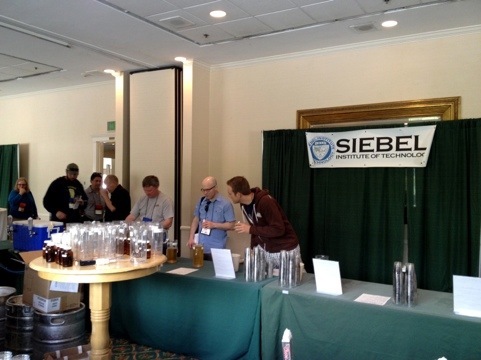 The Siebel Institute of Technology hosted an off flavors in beer calibration tasting at The Craft Brewers Conference Friday. The tasting used Coors Light as the control and base beer and then spiked twelve samples with different common off flavors found in beer. These included: Acetaldehyde, Contamination (Diacetyl and Acetic acid), D.M.S., Isovaleric Acid, Spicy (cloves), Papery (oxidation), Diacetyl, Ethyl Acetate, Ethyl Hexanoate, Geraniol, Hefeweizen (Eugenol and Isoamyl Acetate), and Isoamyl acetate. Participants were instructed to sample the control beer first (unspiked Coors Light) and then move on to the spiked samples. Attention should be paid to smell, taste and mouthfeel with each of the spiked samples. The levels for the spiked samples were fairly high to help the off flavors stand out more and make them more easily detected. For my part I was easily able to smell and taste the off flavors in all but one of the spiked samples. It turns out I’m not very susceptible to D.M.S. sticking my nose in the glass for a good whiff and then tasting there was a very slight difference, a dry sort of bland taste, but it wasn’t easy for me to pick up on. I even resorted to getting a second glass with the control beer in it to smell and taste side by side but the two samples were almost (but not quite) identical to me. In a commercial beer where D.M.S. might show up in lower amounts without a control sample I don’t think I would be able to detect it. As strictly a beer drinker that might not be such a bad thing, but as a homebrewer and someone that likes to critically evaluate beer it could be a problem. With this knowledge that it is hard for me to detect D.M.S. I can work on improving my ability to taste it through more sampling and analysis. 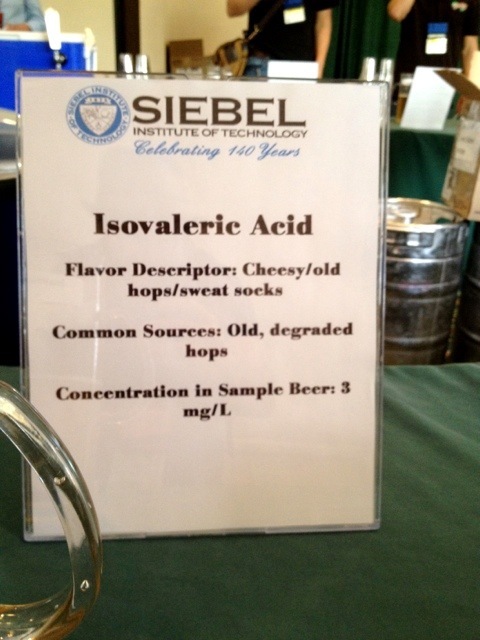 On the other end of the spectrum the Isovaleric Acid spiked sample was one of the worst thing I’ve ever tasted. The description of sweat socks and cheesy held true for both the smell and taste, it was repulsive. I’m happy to say I’ve never had a commercial beer contaminated this badly with Isovaleric Acid, and hope I never do. This was my first time doing a comprehensive off flavor tasting and I highly recommend it to anyone interested in craft beer. The Siebel Institute offers classes on off flavors as well as kits one can purchase to spike beers with off flavors on their own.